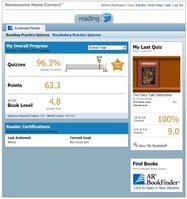 Just a reminder to sign up at the Home Connect website to see the books your child has read and quizzes taken. It is interesting to see their bookshelf get filled! Also sign-up in the top right corner to have an email sent to you every time your child takes a quiz. All you need is your child’s username (firstname.lastname) ex. john.doe. You will need to ask your child for their password.